THE IRISH WOMAN who was injured when a car was driven into pedestrians in Melbourne, Australia yesterday is in a stable condition. 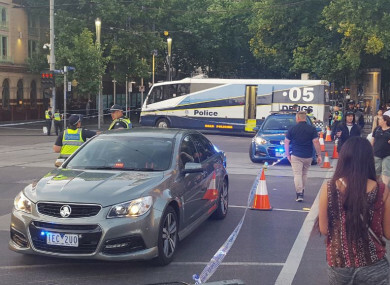 Victoria Police are treating the incident, in which a man drove a car up tram tracks before veering into a large group of people, as a deliberate act. The driver, a 32-year-old Australian citizen of Afghan descent, was arrested at the scene. Speaking to reporters yesterday, Victoria’s acting Police Commissioner Shane Patton said the man has a history of drug use and is understood to be receiving treatment for a mental illness. An investigation into the incident – which happened in downtown Melbourne at a busy intersection at around 4.45pm local time (5.45am Irish time) yesterday – is ongoing. The man said he carried out the attack to avenge “mistreatment of Muslims”, authorities said today, adding that they had found no link to any terrorist group. Speaking at a press conference, Australian Prime Minister Malcolm Turnbull called the incident “a despicable and cowardly act”. “To be attacked like this, in the middle of one of our great cities, is a shocking event, a shocking crime. He has said, in a number of what the police are describing as utterings, that he attributed his actions to perceived mistreatment of Muslims. In a statement released today, police said 20 people presented to hospital yesterday and 18 were admitted. Currently, four people have been discharged and 14 people remain in hospital – three of which are in a critical condition. The 32-year-old man alleged to be the driver has been released from hospital and is currently in police custody. He lives in the Melbourne suburb of Heidelberg West. Crime Department detectives will interview him once he has been medically cleared, police said. The off-duty police member who arrested the driver remains in hospital. He has undergone surgery and is stable. A second man, 24, who was filming the incident was also arrested by police. Patton said this man was in possession of a bag with three knives in it. Today police have confirmed that this man “was not involved or connected with the initial incident, has been interviewed and released”. He is expected to be charged over possessing cannabis and a controlled weapon. These offences are not linked to the initial incident. Victoria Police believe this was an isolated incident and said: “The community can be assured that we are doing everything we can to keep the community safe. The community can expect to see an increased police presence at a number of events today and at major events in coming weeks. Police have urged witnesses to visit their local police station or contact Crime Stoppers to submit information anonymously. People who have footage or images of the incident have been asked to upload them here. Email “Irish woman in stable condition after being injured in Melbourne car attack ”. Feedback on “Irish woman in stable condition after being injured in Melbourne car attack ”.